Ummm, YouTube…I’ve known about YouTube for a while and have spent many a time surfing through the random, memory-jogging, sometimes pointless, sometimes wonderful finds on this site. Just today at lunch co-workers and I were talking about laughable movies that we watch again and again. 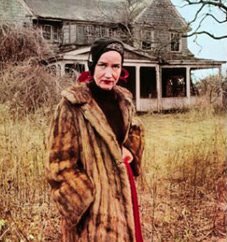 Soon we were talking about Grey Gardens (the 1970’s documentary about the reclusive aunt and cousin of Jacqueline Kennedy Onassis). You just can’t talk about this film without going into character! I’d heard that there was a remix of Little Edie (seen here in one of her “revolutionary outfits” doing a bit of a jig to Madonna’s song “Hung Up.” Sure enough I later found it on YouTube with a very simple search (Hung Up Grey Gardens). If you’ve ever scene Grey Gardens (especially if you can quip and quote it) you’ll want to see this little ditty. I’m working on figuring out how to get the video embedded in my post…we’ll see if Little Edie comes dancing across the screen any time soon…stay tuned.